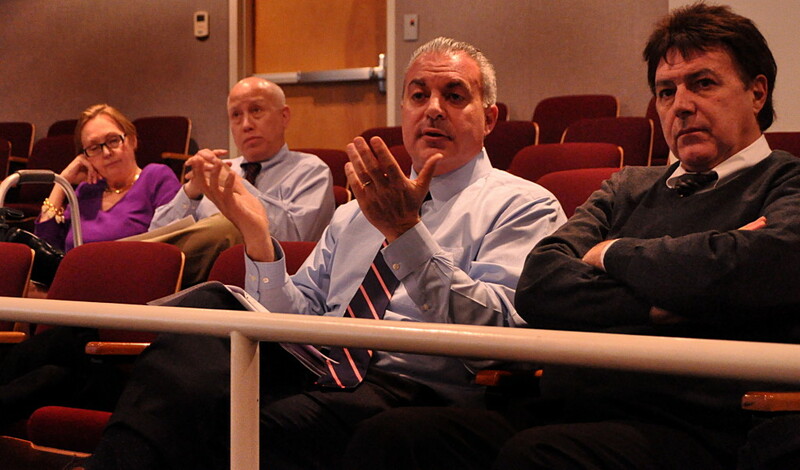 Norwalk Public Schools Chief Operating Officer Elio Longo, center, explains to Common Council members Thursday the ways in which the Board of Education covered shortfalls before his arrival. NORWALK, Conn. – A $1 million deficit in the 2011 Norwalk Board of Education special education fund caused Common Council members to express shock Thursday evening. The $1,051,210 figure in fiscal year 2010-2011 was revealed during a council finance committee discussion of the BlumShapiro operational review of the BOE special education fund from 2009 to 2012. It was part two of the presentation of the review; the first part was at last month’s committee meeting. Dominic Barone and Jeffrey Ziplow of BlumShapiro had more statistics. In FY2008-2009, there was a $452,587 deficit. In FY2009-2010, there was a $683,319 deficit. Yet none of this got any attention. The BOE reconciled its budget without asking the city for money, apparently by transferring money from other accounts, Norwalk Public Schools Chief Operating Officer Elio Longo said. Longo, who was hired in late 2011, said that, prior to 2012, the board of education was solely focused on the bottom line. Transfers from one account to another were made at the end of the year to reconcile the total figure. Councilmen Nick Kydes (R-District C) and Matt Miklave (D-District A) voiced the strongest opinions on that. Kydes gave Longo a new moniker as he expressed his feelings. Pauline Smith, director of pupil personnel-special education for three years, said she was aware her department was dipping into the red, but that it wasn’t her responsibility to figure out how to deal with it. That drew a strong rebuke from Kydes. Committee members quizzed the two people present who would have knowledge of past practices – Interim Superintendent Tony Daddona and Kimmel, who served on the BOE from 2005 to 2009 – if transfers had been made from one BOE account to another without board approval. Kimmel said that, in September 2009, the BOE was surprised with a stack of requests for transfers, all relatively small. They were told it was because budgeting was done in advance and that it was impossible to predict exact amounts that would be needed. Councilman Doug Hempstead (R-At Large) said that, on the city side, there is a laborious process of running budget adjustments through the Board of Estimate and Taxation and to the council for a vote. The BOE policy “blows my mind,” he said. The meeting ended with a positive note – Kimmel handed Longo a handmade sheriff’s badge, drawn on a sheet of paper. Committee Chairman Carvin Hilliard (D-District B) thanked the BOE personnel for coming to the meeting. Great Job Matt Miklave. Matt’s been pushing for a top to bottom “Regular, Rigorous, Review” of all areas of the budget. Just a week or so ago, Matt spoke of the irregularities in the education insurance fund…a fictional line-item called a GASB Offset. Now we’re finding more irregularities totaling more than $1,000,000.00. How many other irregularities exists? How much savings might Norwalk’s taxpayers see if Matt’s Performance Based Budgeting plan is implemented? We obviously need a budgetary watchdog in the Mayor’s Office We obviously need Matt Miklave for Mayor. By The Way Matt– When your opponents respond to my post and use words like obfuscate, perplex, effusive, garrulous, loquacious, verbose, windy…hey clearly aren’t capable of understanding the meaning of your message. In just a few short weeks, while Matt Miklave has been discussing the merits of budgetary reform, we’ve found financial “issues” in the Town Clerk’s office and the BOA. Both of these offices are the Mayor’s responsibility. I’ll ask the same question Matt asked weeks ago. Who’s watching the bottom line? We need a watchdog in the Mayor’s office. We need Matt Miklave. You go girl! Chrissy’s Right! Matt Miklave is the only mayoral candidate talking about budgetary reform. The others are just pandering to voters and promising more spending on education, more spending on job creation, more spending on crime prevention but never telling us how they’re planning to pay for their government expansion. The other Dems. in the race, especially Rilling and Mangiacopra are telling voters whatever they want to hear. Neither has a plan. The result of their “just throw money at the problems” approach will be dramatic tax increases. Matt Miklave IS the only tax & budget watchdog in the race. We need Matt in the Mayor’s office. Without commenting on Miklave’s candidacy, there are laws seperating the management of BoE money from the management of City money. The only time that line is crossed is at budget time when the BoE asks, and the City gives, a certain amount. After that the BoE has total control and is not required to follow the same money management procedures the City follows. Because they can, a lot of sloppy money management practices have evolved in our BoE, and are no surprise in any CT BoE. Setting a budget requires a lot of estimating and money is never returned as unused for fear of the effect on the following year’s budget. The whole process needs reform, but reform will require a change in State law and that change will be resisted by well intentioned people who are afraid of opening the door for way to much politics in running schools. No mayor will ever get much reform done on his or her own. My real name is Bruce Kimmel and I never hide that simple fact when I contribute something in writing to any of the local print or electronic media. I have also had the opportunity to debate with Miklave on the Common Council for a number of years and many of those exchanges have been honest and direct. We differ on many issues. Of course, I have debated other members of the Council, as well as members of the BOE, going back to 1997. And many of them, irrespective of what has been said above, have had all kinds of interesting and innovating ideas about budgeting. I do not believe that the over-the-top cheerleading from Chrissy who seems to comment on just about any local article that features Miklave or is written by the candidate)and KSully is appropriate; nor does the exaggerated nature of the comments help the candidate. I also believe such supporting contributions should always use the actual names of the writers; that way those who follow blogs will know how many folks are actually doing the writing. The only contribution the Miklave made to the discussion is to express feigned outrage. Miklave didn’t explain why during his eight years on the council and eight budgets he missed the opportunity to discover the problem and protect taxpayers. Why didn’t he know? … or did he? Miklave is a quick study yet he voted on seven prior budgets without raising flags; why now on the eighth? Why didn’t he complain about the budget process when Knopp was Mayor? Why didn’t he dig deeper into the problem when the Board of Ed was 100% democrat? Could it be that he knew all about the problem but being a labor lawyer, he felt more compelled to protect the interests of Tony Ditrio’s NASA members over the interests of our taxpayers? He’s faulting Chief Operating Officer Elio Longo, a non- union administrator, but he’s not asking for Pauline Smith’s head, the one who admits covering up the problem. Of course not: it would be political and professional suicide for Miklave to call for a union member to be fired. I’m wondering whether his firm, Epstein Becker and Green, actually represents any Norwalk union, or if tere are other conflicts of interest? If he wants transparency, he should release his firm’s client list. Being an equity partner, he would have no trouble doing so; that is, if he truly wants to be transparent. The issues at the BOE have been known for some time. Before councilman Miklave was interested in their accounting practices he was all for fully funding thier budget requests without much questioning. Just last March he advocated underfunding long term pension obligations to the tune of $5 million in order to fully fund the BOEs requests. He basically stated that the actuaries and governmental accounting standards setters really don’t know what they are talking about. Don’t take my word for it, it is right in the minutes of a council meeting from last year. In the next meeting he voted to approve these minutes. What other cities do is their business, but one of the reasons Norwalk enjoys a AAA bond rating and cheap, readily available debt is because it is managing its long term obligations effectively and better than most. The process is flawed and has been for many administrations. This is not, news, to anyone. The Board of Education receives a recommended budget from the Superintendent, who receives targeted projected costs and needs budget statement from each department head within the school system. The Board of Education than reviews and revises,than forwards a (requested) budget to the Board of Estimate, which in turn than sets the budget for the Board of Education and than forwards the now (numerously) revised school budget to the City Council for passage and adoption, which usually no always passes whatever the Board of Estimate recommends, (usually around 2% increase annually), regardless of what the Board of Education – Superintendent – School department administrators request or need. Thats what we all have been witnessing play out year after year, administration after adminstration. In all fairness, it is true that a department head has no control, influence of, or exposure to the budget proccess to neither the Superintendent, the Board of Education, the Board of Estimate or the City Council decisions other than the submitted requested budget for his/her departments and allowed public statements at public meetings. It is wrong, classless and may expose the city to a formal complaint, for a city council member to berate a Board of Education administrator and it is laughable that another (long time, some say too long time) council member is shocked by the process.Shocked? Really? C’mon. Oh yeah, the roads are getting paved, (thats another whole pandoras box), sure enough, electioneering already has begun. Anyone that has been paying, even slight, attention has known this is how it works and has worked for sometime. The behaviours and judgement abilities (competence) by elected council members and the administration would be laughable if we were in a trance watching mindless tv sitcom. But its not fiction. It is non fiction and so sad and so, so frustrating. The city just breezes through Superintendents and administrators, why? Could it have something to do with integrity? Not having a magic wand. Your the superintendent, you make it clear what you need to do your job effectively but the city blocks you and tells you that you have to do more with less and less and less, year after year after year. expenditure for the city, yet the Board of Education, nor the Superintendent, nor school administrators do not have any real voice or influence on how much they receive to carry forth they’re mission to educate our children. That a well known council member, that over his tenure has done everything possible to reduce or eliminate services for minority’s, at the same time involved in many conflicts of interests with the city, in plain sight, well, its sad and hurts far too many and the entire city as a whole. How many points does a status quo sheriff badge have anyway? When you wonder why things are, they way they are, no one to kick but ourselves, for not paying close attention to who we put in those elected/appointed chairs and why we put them there. While the(adults), er,(debate),what about the mission? Educate and properly prepare our children? Miklave is in a difficult position. He knows that the vast majority of voters are turned off by his efforts to buy Union votes with our tax dollars. He also knows that it looks bad when NASA union leader Tony Ditrio is his campaign’s finance chief. So he’s now trying to cloak himself in the language of fiscal responsibility and hope that the voters will ignore his past actions. Ignore what he does, and just accept what he says, in other words. The problem is that every dollar in the City budget has a constituency. So Miklave can’t propose specific cuts because just about any cut will affect a union job, and Miklave is desperate for union support. The result is his proposal which boils down to “let’s look closely at the budget and maybe we will find some savings.” With the savings which may or may not occur he is talking about adding police officers, giving more money to schools, or maybe not raising taxes – it’s not clear. All are worthy goals, but it’s pie in the sky since he has no idea of what savings can be found in the budget, if any. Of course there is also the question of why he hasn’t identified any savings in the budget during his entire time on the Common Council. It would be easier to believe Miklave’s claims if there were some evidence from his time on Council that indicated a desire to save money for taxpayers, rather than using our money to buy support from municipal employee unions. Looking at his resume on the company’s website (http://www.ebglaw.com/showbio.aspx?Show=2461), it is clear Miklave is a respected labor relations lawyer whose practice has been limited to representing employers, NOT unions. In fact, he frequently lectures on how to keep unions out of companies. His firm, as near as can be learned from their website, does not represent any union clients. Do you actually think facts mean anything to LWitherspoon or any Republican for that matter . All he/she does is spew its anti dem everything while saying he/she is not a Republican. However I can understand him/her being ashamed of being a Republican as its the party of destruction. After reading Mr Miklave’s Resume, Norwalk would be lucky to have someone of his education and experience. I made no secret that I was and still am a fan of Andy. However that is quickly switching to Mr Miklave’s as he is not afraid to attack he big issues. It is ironic that Mr. Miklave’s professional career involves working against unions, because in his public career he does the exact opposite. His numerous votes supporting union positions are well documented and show a complete disregard for the fiscal responsibility that Mr. Miklave now claims to have. I do think it’s interesting that when it comes to making money for himself, Mr. Miklave fights unions. When it comes to increasing his own political power, he consistently votes to support unions with our tax dollars, and he installs a Union head as his campaign’s finance chief. Am I the only one who sees the craven hypocrisy in that? Somehow, we are not surprised you do not understand when someone elected to represent the people actually votes the best interests of the people, especially when that vote does not agree with your position. Did you support Mr. Miklave’s proposal last year to short-fund the City employee pension plan to pay for more City spending? How many times do we have to hear about these budgetary “discoveries” in the BOE, the clerk’s office, at the Oak Hills PA, before we decide it’s time to elect new leadership who will take budgetary responsibility seriously and hold folks accountable like public companies do? A very good question. The Democrats would have us believe that this is all happening because Mayor Moccia is asleep at the switch. The Republicans would say that there will always be discoveries of this nature, and it’s only through the administration’s vigilance that we became aware of these issues. I do think that it’s difficult to group all of these situations together into one category. The question of who is responsible for each of them, and how to avoid such slip-ups in the future is far more complex than either side would have us believe. The great mystery is why the BOE refuses to follow the practice of many BOEs and appoint a Financial Review Board composed of senior level financial executives. Neither the BOE nor the Common Council nor the BET bring the requisite skills to the task. Sloppy accounting practices do not benefit the City. The BOE can’t abdicate its responsibility for fiscal affairs by appointing a Financial Review Board. The real answer is to have some BOE and Council and BET members with financial experience.